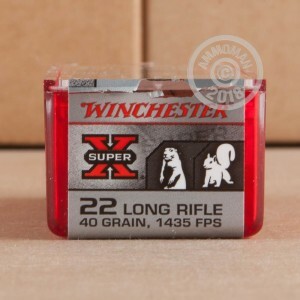 Winchester Super-X 22 LR ammunition is a great choice for range training and small game hunting. These rounds feature 40 grain copper plated hollow points that are hyper velocity and leave the barrel around 1,435 feet per second. These rounds provide plenty of punch to help you knock down small game and varmints and will cycle semi-automatic firearms with ease. 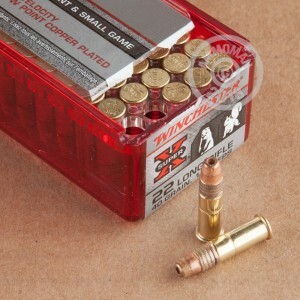 Winchester has been producing quality firearms and ammunition since 1866. Their ammo is made in America at their Alton, Illinois manufacturing facility. Winchester is a major supporter of wildlife conservation groups as well as shooting sports organizations to help keep our outdoor way of life strong. 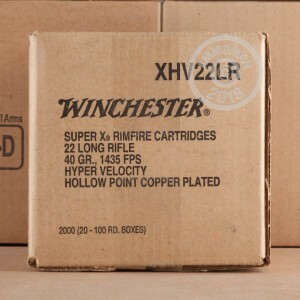 Pick up a couple 100 round boxes of this Hyper velocity 22 LR ammunition today! Don't forget, at AmmoMan.com all orders over $99 will receive Free Shipping, so stock up and save! I never have complaints for these little guys. Everyone fires clean and hits where I aim. Price cant be beat.